I’ve been wanting to blog about my weaning experiences for the longest time now. And since the topic is so extensive, I decided to do a three part series that will talk about how to introduce solids to your baby. 1. Essentials for introduction of solids. 2. Choosing between Baby led weaning and Traditional weaning. 3. 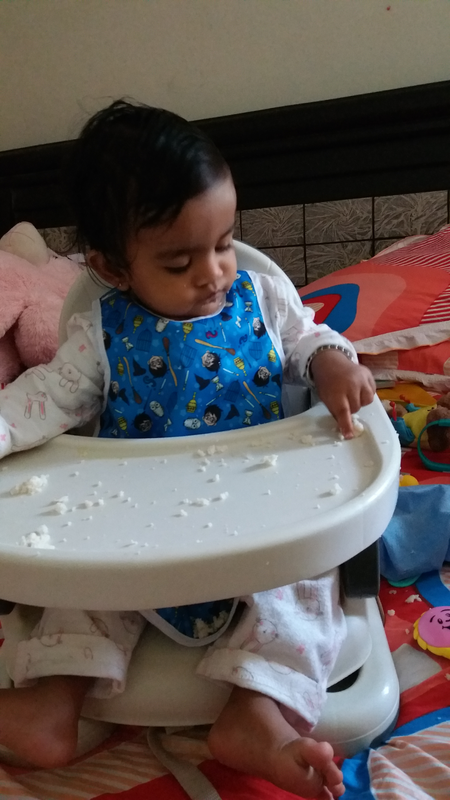 Why I combined Baby led and Traditional weaning and how it helped me. This is the first part in the series. In this post, I’ll simply try and list out the things you need to be ready with or ready about before you introduce solids to your baby. But before that, you need to be sure that your baby is also ready to be introduced to other foods apart from the breast milk or formula milk that she has been on since birth. There are a few pointers that can show you if your baby is ready to be introduced to new foods. 1. Looks at you with interest when you are chewing or having your meals. 2. Can hold his/her neck up and support it well when made to sit in a chair. 3. Has a healthy pee and poop routine and is gaining weight at a decent rate. 4. The doctor has given the green signal. 5. Most importantly, your maternal instinct informs you that it’s the right time. It might be a stretch to put a lot of emphasis on your gut feeling but I went with it and I’m quite happy about that. To each, their own. The age to introduce solids is also a much debated topic among people. Some are strict with the 6 months mark and for some, four months is also acceptable. Ideally, any time after the baby has turned 5 months old is good but the introduction of solids depends more on the readiness of the baby. If your baby looks very interested towards food, you can try. About what to give as first foods and how much to give, I’ll talk in my next post. So keep an eye out for that. Here is a list of few things to keep in mind and a few things you will need to invest in when you introduce solid food to your baby. Or a regular chair which will be a dedicated space for your baby to sit and eat. 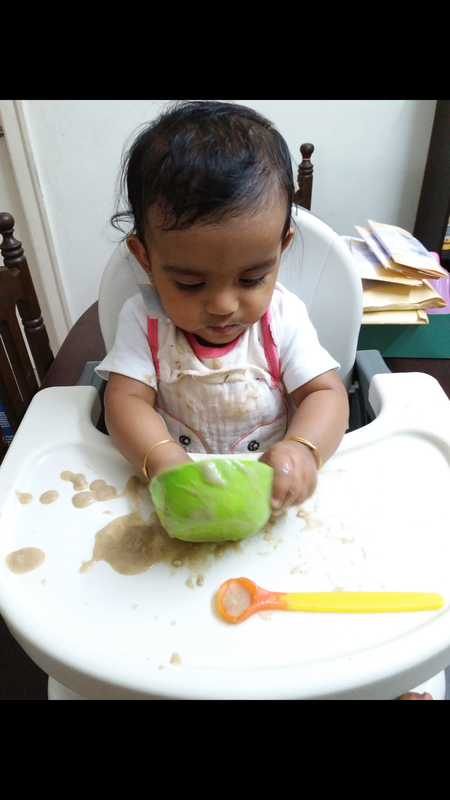 Whether you follow baby led weaning or traditional weaning, you have to make sure that the baby is sitting in one place throughout her feeding session. As they grow up and become more mobile, they want to be actively on their feet, even while mealtime. Which can be very exhausting. Making sure that the baby sits put in a chair while they are eating will get them used to the idea of a dining chair. And that the chair is meant to be seated in during mealtimes. We are using the MeeMee booster chair and are quite happy with it. It is height-adjustable and is quite sturdy and big to accommodate the baby as she grows up. Babies will make a mess, they find order in chaos. So to that end, it would be the best idea to invest in a few bibs. Preferably, plastic or something similar which does not absorb food and get soaked in water. For parents pursuing baby led weaning, it is essential that you choose plates and cutlery that are completely baby friendly. The feeding spoons nowadays some with the silicon upper portion which retains the shape of the spoon and holds food but also bends and is soft on the gums. Perfect for self fed or newly weaned babies. If you are a traditional weaning parent, you are the one handling the food but make sure what you use is safe enough to be held around the baby. The older they get, the more boisterous they become. #BabyHashtag uses the tray of her booster as her plate for when she is handling her own food. Other times I feed her out of a plastic baby feeding bowl. If you are really intent at buying something sturdy and eco friendly for the baby, try Avanchy. They have a fun range of bamboo plates and bowls with suction bottoms. Perfect for babies feeding themselves. I’ve heard so many mums telling me that feeding their baby got so exhausting and eventually real life got in the way so they had to succumb to technology as an aid to make the baby eat. I will not lie, there have been times when I just switched on BabyTv hoping to finish mealtimes without a tantrum. But I needed other legit distractions for the baby because watching tv and eating food only made her totally absent minded about what she was eating. She did not enjoy her food, she did not know what she was eating. She merely let me put the loaded spoon in her mouth. Bad, right? That’s when I changed tactics. The rhymes were now sung, play acted in front of her by yours truly. I talked to her, made slight conversation and she started responding. Initially with actions and then with sounds. She is a very communicative baby, and I try and keep it that way. Books also help us along the way. She has a total of 4 books that she likes to read and browse through whole eating. She gets visibly excited at seeing repetitive images and tries to say their names in the gibberish she knows. All this makes mealtimes very rewarding. If you want to know my entire mealtime routine, let me know and I will do it for you. Babies and toddlers eating food is messy, there is no doubt about it. Instead of making a fuss over how much mess is being made, be prepared in advance about it. Keep a wet and a dry hand towel always on the ready. The wet towel will make sure to clean up nice in case the food was sticky or has dried up and become coarse. The dry towel can be used to brush off any crumbs or dry fallen food. You can obviously use wet wipes to serve the purpose. We at home alternate between using wet cotton hand towels and wet wipes. Since wipes were wasteful, we switched to cotton hand towels. But we made the switch back to wipes since Mamaearth launched their organic bamboo wipes. There’s a lot less guilt now you see. Though initially water intake in babies is restricted to a large extent, it is advisable to keep some water ready. In the first few weeks, it acts as the palate cleanser for the baby, getting used to the different tastes and flavours offered to them. After the consistency of the food or the texture of the food changes, water will help in gulping the food down in case it lodges in the throat. Water will also facilitate healthy digestion in infants. We use a sippy cup from MeeMee which comes with a straw attachment that can be used after the baby grows up a little. There you go! I hope that is not too much information in one post. I tried to keep it as concise as possible and I’ll be back with the second part to this post in a couple of days. I’m glad you spoke about distractions. Its really important to set the right mealtime environment so that the child develops a healthy relationship with food and has a choice in what and how much to eat, rather than just eating because she is being force fed. This is such a comprehensive post. Very useful. 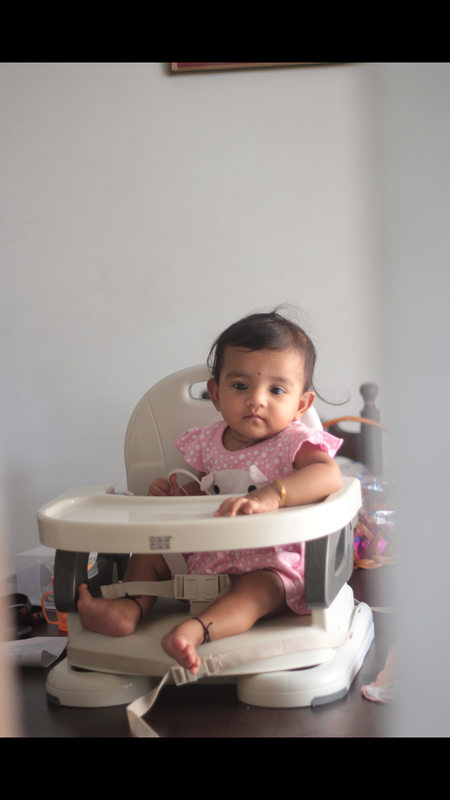 I agree that a baby high chair should be used while feeding baby so they develop a habit to sit and eat. Also I always used to sit tonhave my meals along with my daughter so she learnt to eat everything by watching me and loves food now. A very comprehensive post. You have enlisted some very useful and helpful tips. Reminds me of the time when we started solids. You have covered most of it 🙂 Great tips. Weaning is an important phase for moms with babies. This post is very helpful for moms with small kids. It reminded me of the time when my kids were small. Lovely pics. We chose BLW and TW both in our feeding journey. Distraction has become important for my hyper-active toddler while eating – so I tell stories or sometimes give gadgets.